SCOTTSDALE — Harvest the rain. Think of it like changing the path of rain. Instead of directing water into puddles, send it toward desert shrubs, flowers and rocks you place in your yard. “By making some changes, by ‘planting the rain,’ we can plant the kind of plant life that likes the infrequency of rain,” said Tina Sleeper, a Phoenix water-resource specialist. It’s called rainwater harvesting. It’s aesthetically pleasing and saves tap water, experts said. “At the simplest level, it’s basically collecting rainwater runoff from a roof or other surface and directing it to a beneficial use,” Sleeper said, speaking recently at a class in Scottsdale. Up to 70 percent of drinkable household water goes into landscapes, and many Phoenix properties are designed to direct water away from yards to streets and storm drains, Sleeper said. “If you have a landscape, no matter how small it is, you can turn that into a little sponge to use that free water that comes from our skies,” Sleeper said. Next time it rains, grab a Google Earth or Maps view of your yard, print out the image and trace where the water flows. Consider what you want from your yard. Colorful plants? Trees for shade? Do you prefer native Sonoran Desert plants? Form a path for rainwater from the highest point to the lowest point of your yard by digging dips and rises in the earth. You can adjust the path to control how much water goes to your plants and how much leaves the yard. 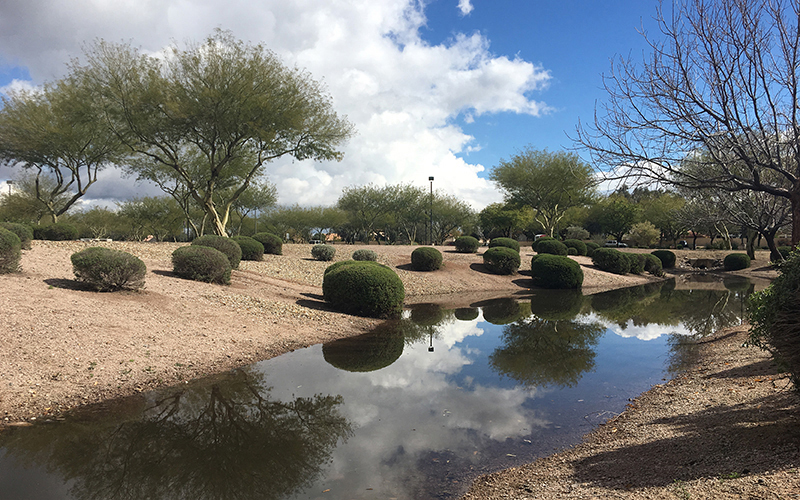 “Mounds and depressions in a landscape can create more interesting areas, provide microclimates for plantings, and be effective in directing and holding rainwater for use in your landscape,” according to Scottsdale’s Residential Landscape Revitalization Workbook. Anyone can practice rainwater harvesting — you don’t have to be an expert, and natural-looking landscapes take less time and energy than more elaborate ones. To start, try digging a small indentation in the earth and adding just a few desert plants to soak up rainwater. “Have an idea of where you want to go, but start small and simple,” Sleeper said. Plant roots prevent erosion and soak up water as it sinks into the earth. By reshaping the land or adding a hardscape structure — a wall or pathway — you can re-route water toward other plants or away to a street or a storm drain. Plants and organic mulch can help absorb water into the soil, while a layer of rocks in some places can provide a place for water to gather and help prevent erosion. Mulch and fallen plant parts will break down over time, attracting worms and bugs that burrow holes in the ground and add nutrients to the soil. Your yard isn’t just about looks – it’s a way of life. A tree can provide shade, privacy or food. It can attract wildlife such as hummingbirds or cactus wrens. Good-looking plants can also increase your property value. Sleeper said to consider how you use your yard — whether children play there, pets explore it or you cultivate a garden. Landscapes change constantly. Rain and wind can wash away soil and vegetation, transforming hills and basins. With care and regular maintenance, you can use rainwater harvesting techniques to create vibrant landscapes and attract a variety of wildlife. “We can take advantage of our natural rainstorms, improve water quality, reduce the amount of water running down our streets so quickly, while also improving our neighborhood and the experience of living in our home,” Sleeper said. Sources: Tina Sleeper of the Phoenix Water Services Department; Rainwater Harvesting for Drylands and Beyond, by Brad Lancaster; Phoenix Water Services Department; and the Water Use It Wisely campaign.